Summary: A distraction both in and out of universe deconstructs the secret identity by way of a horror movie, in which we go bananas over Grodd. After contemplating Barry’s identity, Iris confronts him, walking into STAR Labs while he’s in his Flash attire. Iris reveals just how angry she is, but Barry tells her how Joe instructed him to keep his identity a secret from her to protect her. 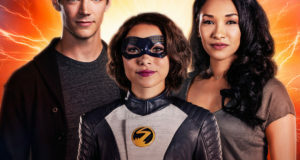 She learns more and more how she’s been lied to — that Dr. Wells is Reverse-Flash and killed Barry’s mother, that he killed Mason Bridge, that he kidnapped Eddie — and is furious with her father for orchestrating the grand secret, blaming him for Eddie’s kidnapping. Meanwhile, a skilled thief plagues Central City, and when The Flash goes after him, he is hit by a mental blast that causes him to experience crippling fear. He is eventually able to unmask the thief as a catatonic General Eiling, who seems possessed by another force. 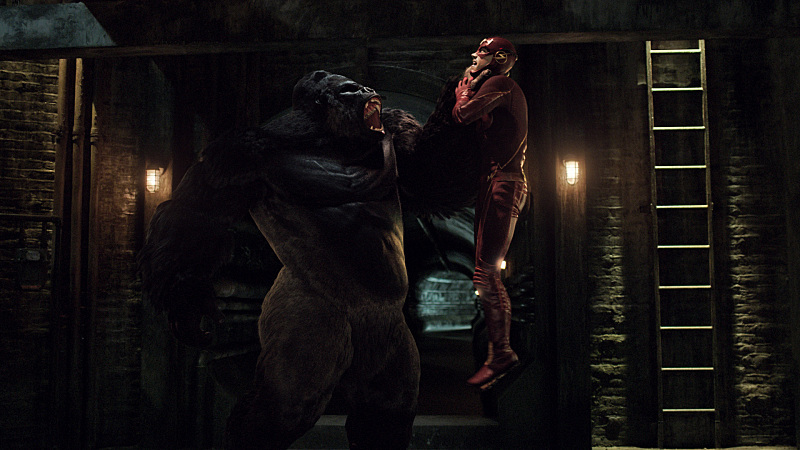 They learn that the force controlling him is Grodd, an gorilla who was experimented on by Eiling but saved by Wells. They deduce that the particle accelerator explosion caused the experiments to finally work, and turned him into a meta-gorilla with mental powers. 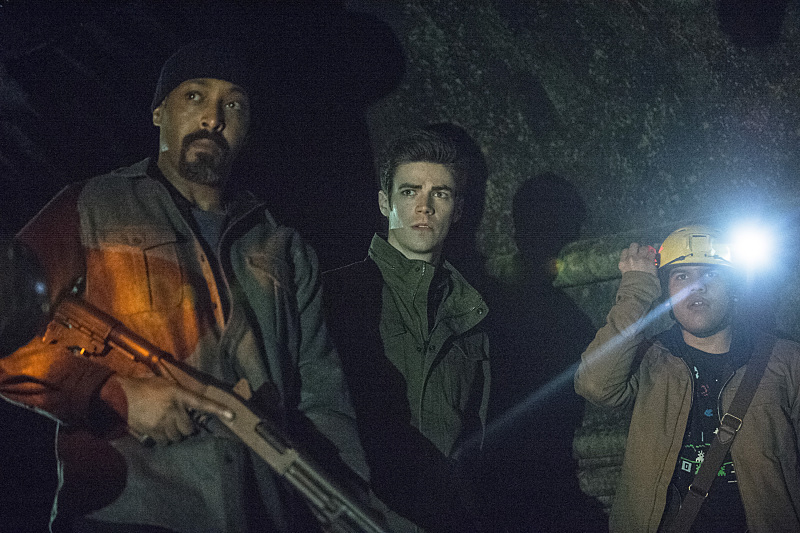 Joe, Barry and Cisco head down into the sewers to catch Grodd, but the gorilla he gets the upper hand after he kidnaps Joe. 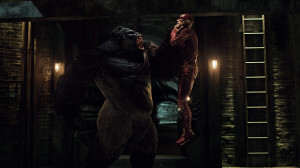 Cisco builds a device to keep Barry immune to Grodd’s powers, but Grodd proves to strong for him, besting him in battle and knocking off the device. As Barry is flooded with fear, Iris speaks into his ear piece and reminds him of the love they share, and her memories bring him back into the fold long enough to get away from Grodd and rescue Joe. Iris forgives her father, and Barry and Iris admit that they love one another, but right now finding Eddie is the first priority. 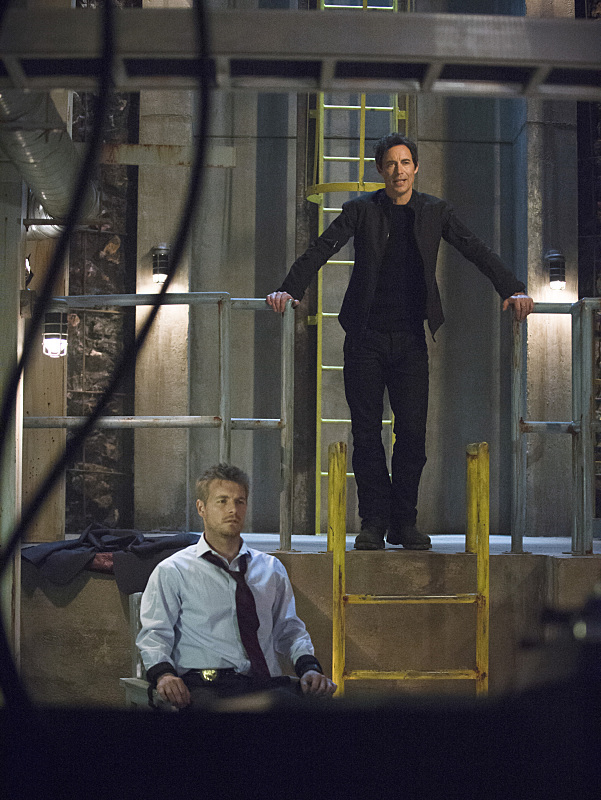 In captivity, Wells tells Eddie how he is the only Thawne that amounts to nothing, and that Barry will marry Iris. He then reveals what appears to be a second particle accelerator. Back in 2008, the internet was aflutter when we learned that Smallville, with its limited CW budget, would be bringing in the nightmarish character Doomsday — a rather extreme, fantastical character who’d require heavy effects work — and making him a regular character. There were plenty of naysayers, but after some intriguing story choices and a wonderful performance from his human form in Sam Witwer early in the season, many were either on board or at least cautiously optimistic. And then the few appearances of the Doomsday creature, and especially the finale named after him, became an infamously colossal disappointment. The monster was only seen in complete (often inexplicable) shadow, and the best-looking views were all-too brief. When the finale hit, the big season-long teased battle lasted 40 seconds, barely had any blows delivered, and basically amounted to the proto-Superman jumping really high with Doomsday in his arms and falling into a pit. There were plenty of other problems with that finale, of course, but the Doomsday battle is easily the first thing people will remember negatively about it. TV shows have limits, after all, and “Doomsday” is proof that a comic book show can never truly resemble a comic book in the way we’d dream of. There are just things that can’t be done, even nearly a decade later. Leave it to The Flash to prove us all wrong, with a character that would arguably be even harder to put on screen than Doomsday. Grodd is a giant Gorilla with mental powers, of course, and not only does he have to be scary, he also has to not look like…well…nearly anything that has ever done a talking gorilla. “Grodd Lives” succeeds best because it manages to minimize Grodd’s screentime while still allowing his presence be felt. From a production standpoint, obviously putting Grodd in the shadows and only showing him at the climax helps remain within a TV budget. But it also adds to the general aura of fear that this version of his character represents. What “Grodd Lives” does especially well is making Grodd scary as hell. Numerous factors are at play here, all working to make Grodd a viable enemy. His backstory is a simple one we’ve seen many times over, a scorned animal who gained human-level intellect and became overtaken by anger. The deeper music coupled along the heavy fog and low-light of the sewers. The brief, sudden close-ups of Grodd’s angry face. The constant echos of Grodd’s booming telepathic voice. Jesse L. Martin essentially playing the most terrified human anyone has ever played. Joe having a gun turned on himself while he screams and cries for Cisco. This is not a good hour for Joe, but Martin sells the absolute terror hard. While Smallville failed to make sense of Doomsday’s lack of integration out of shadow, Grodd’s presentation set the entire tone of the episode. “Grodd Lives” is a horror movie, plain and simple, and it’s all the better for it. Before the big guy even comes into play, the opening plot with General Eiling is a great appetizer, turning a brutally dangerous man into a shell of himself. It helps that Clancy Brown is the first full time we hear Grodd, technically, as Brown’s distinct voice lends much-needed weight to the mostly unseen character. As Cisco points out, Eiling’s situation is akin to a demon possession or alien hijacking, stripping all agency from the body and forcibly speaking through him. Brown’s dead-eyed performance totally sells it. Even the non-Grodd scenes are more shrouded in darkness and shadow than usual; while I’m positive no newspaper would ever be so dead, that Iris and Joe have a heart-to-heart in the darkened office of Picture News fits into this. The Flash still isn’t a terribly dark show, but the past few episodes have taken it to much darker places, and that’s being reflected now in the mise-en-scene. In a lot of ways, “Grodd Lives” may count as the season’s darkest hour, if the following two episodes don’t amp up the tragedy (which they still very well could.) 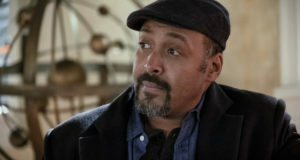 Arrow has the tendency of throwing out a huge death or tragic turning point a few episodes before the finale, and it seems that this might be The Flash‘s version of it, perhaps coupled with last week’s stellar outing. Everyone is pretty down in the dumps, and considering Grodd is out and about by episode’s end, the heroes don’t even technically beat the bad guy. We’ve got the STAR Labs crew dealing with their loss, not only of Dr. Wells as a friend, but a fourth member of the problem-solving team. It’s not that they’re completely incapable without Wells, but without that glue and with his betrayal hovering over their heads, it’s easy to lose confidence in their own abilities. That, of course, provides a timely segue for Iris being in on the secret, as she gets to provide an objective view of the team. Frankly, they look rather pathetic — their doors are constantly unlocked, allowing her to walk in on them mid-conversation not once, but twice — and, as harsh as Iris comes across this episode sometimes, she’s right to criticize their lack of faith in themselves. She ends up being the shot in the arm they need, along with becoming the de facto fourth member of the team. With that, Iris something of a wild card now. 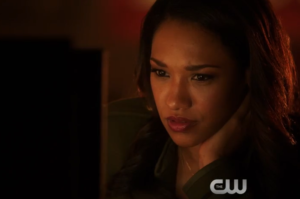 This is a very complicated episode for Iris, and Candice Patton handles the material well. Patton isn’t the strongest actress on the show all the time, but she’s very enjoyable to watch, and shows signs of significant growth in the different sides we see of Iris tonight. Keep in mind, I say different, and not varied — Iris is predominantly angry and even uncharacteristically shrewish throughout, but damn if it isn’t warranted. It’s easy to see Iris as a divisive character in this episode, because on the surface, she generally brings things down and makes life a little bit harder for everyone this week. The thing is, though, it’s absolutely justified, and even cathartic. Iris’s dialogue — and Patton herself — is particularly on-point when she lays it all into her father. Again, it’s a tough sort of scene to get through, because we love Joe and Iris is full-on attacking him. But the attacks are exactly what the problems with Iris’s storylines have been all along. Keeping her in the loop could have kept her safe and not annoyingly in the way! Literally everyone in her life has either been involved, murdered, or kidnapped! None of the logic behind the secret ever made sense, and she calls both Barry and Joe out on that. Grant Gustin does some great work as he nearly loses it with Iris, covering his face during the conversation and barely able to get a word out. This is Barry’s greatest dream and worst nightmare come to life at once, and coupled with the circumstances and stress of it all, it’s no doubt that he’d have trouble processing, especially when he can’t even fully explain why he agreed to Joe’s secret-keeping promise to begin with. Barry tries to throw out that Iris lied about not loving him at Christmas, which isn’t untrue, but it’s an extremely weak counterpoint given the circumstances. We even get Joe apologizing for his crippling overprotectiveness, as if the show is continuing the trend set by “The Trap” to practically apologize for all its past misdeeds. That’s what’s interesting about the timing and execution of Iris coming in the know. It seems like a self-aware deconstruction of the “lie to the ones you love” trope that’s been carried along in the first season. It’s even more interesting in the context of where Arrow took Laurel Lance in season 2, as well, as that was essentially a deconstruction of a superhero love interest after she stops being the superhero’s love interest. Iris is very much still the love interest, but much like how Laurel presented how miserably a typical love interest can fail when her story falls flat, Iris spells out everything wrong with the superhero secret identity trope. In many cases, sure, secret identities are justified. But when you have someone who has numerous connections to what’s happening and constantly gets put in danger anyway, she’s going to serve better as an asset than as an object. Iris gets a small chance to prove that this time around, though it’s still unclear how she can fit the show. Right now, she’s squarely Barry’s heart, his constant. Love isn’t going to solve every crisis, but that type of foundation is still an important piece to have that Iris has to offer, even if it’s not clear where her story will move going forward. 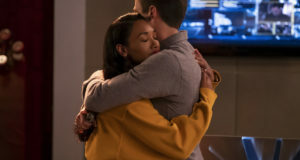 The episode is smart to examine the white elephant of Barry/Iris so closely, acknowledging that there are definitely mutual feelings, but also that what Iris and Eddie have is real, too. There are many directions the show can take this love triangle, but thus far no one has been so selfish or impulsive as to cheat (unless you count the reset timeline, I guess) which is a good thing. And poor Eddie truly gets the short end of the stick in this hour. Even in his minimal screentime, Rick Cosnett gets more varied things to play than anything in the season’s first half. Wells utterly breaks Eddie down — he’s literally been proven by history to be worthless and forgotten, he’s barely important to Wells’s plan, and he doesn’t even get to stay with Iris. It’s brutal, and Cosnett is superb at processing the most soul-crushing news of his life. Tom Cavanaugh revels in his delivery, too, as Wells goes full-on villain — complete with extra spikey hair, eyeliner, and a popped collar — and honestly, it works for him. The disgustingly grandiose ego Matt Letscher and Cavanaugh have both hinted at has completely flourished now, and while the make-up and costume choices are a little bit trite, it seems fitting that Eobard Thawne be so profoundly arrogant that he makes it work. That arrogance why he’s totally okay with allowing a super-smart gorilla to be nothing more than a “distraction.” And an entertaining distraction it is, even if it ever-so-slightly slows the march to the season’s endgame. “Grodd Lives” is definitely a stall tactic, and suffers from coming after the series high in “The Trap,” but it’s the best possible scenario when it comes to stalling. 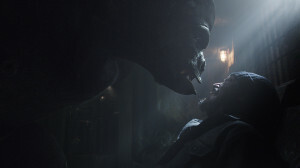 Grodd is a villain we’ve all been hankering to see, and while we technically don’t see much of him, he makes a tangible impact on the world and characters of the show. And the characters are moving towards their place for the finale and the future, with a new post-Wells status quo already settling in. As a distraction, it’s certainly not one worth skipping. Iris’s voiceover is short and on-the-nose, but it’s fitting. I’d like to see the show rotate out its voiceovers occasionally on episodes that aren’t as Barry-centric. A Wells voiceover would be fun, just to a peek into Eobard Thawne’s psychotic internal monologue. 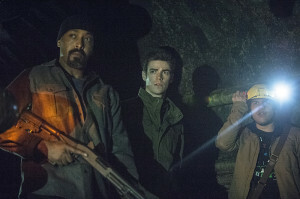 I know they’re trying to keep Barry’s identity a secret and all, but it’d make a bit of sense telling the police that Eddie is missing at least to have some extra eyes and ears, right? It’s a tough situation, because you don’t want the human police to face someone as powerful as Reverse-Flash blindly, but it also makes the team look way too passive. Like, “Well, we haven’t found him yet, guess we’ll sit here and wait for clues.” We know the police are aware of The Man in Yellow considering many cops faced him in the mid-season finale, and we’ve had Cisco aid in giving the police information on metahumans before. At least Iris calls them on that one, too. It looks like Candice Patton has some red highlights in her hair, most visible when she’s backlit at the darkened Picture News. Probably a subtle nod to her comics counterpart, since they often did the same thing with Lana Lang in Smallville. Caitlin and Cisco “acting normal” is the best. What part of superspeed allows Wells to turn his eyes glowing red, exactly? Love the brief mention of Lyla. Sometimes this sort of fanservice is hamfisted, but in-universe mentions like that are natural and relevant. I love when characters attempt to reuse previous methods of defeating bad guys. Too often are solutions usually one-and-done, and it never makes sense that characters don’t try things more than once. The supersonic punch fails this time, of course, but it was a good idea. Yeah, Barry has super healing and all, but could he really get back up from being chucked through a solid brick wall so easily? “If I hadn’t seen Jurassic park I wouldn’t be nearly as frightened right now.” – Are you sure about that, Cisco? This seems pretty frightening all-around.